So … you probably expected a Blog Post about the iStripper, right? Sorry to disappoint you. In just a few minutes from now, we’ll update you on that as well. For now … we proudly present the iMasher. What it is? Well, if you want to dive in … just scroll down, and then down some more. Look for that Blog Post called “I had a dream”, where I shared a vision about where we want to take iStill, if we pursue our pay-off “Distilling made easy”. Sizes: 150 liters, 250 liters (perfect for the iStill 250), 500 liters (for two runs with the iStill 250), 750 liters (etc. ), 1,000 liters (for the iStripper). And, for perfect alignment with the iStripper, we will also offer 1,500 liter iMashers from next year onwards. 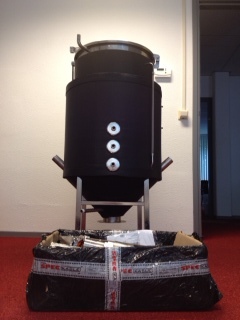 Anyhow, here’s a first picture of the 150 liter iMasher model being assembled in the iStill Center as we speak. This is just the basic (if that’s the right word) boiler/tank. Appendages like heaters, computer, stirring device, etc. have yet to be installed.